Skottie Young is an artist and writer best know for his Marvel baby variant covers and his comic adaptation of the Wizard of Oz books. Young's take on the Oz characters is nothing short of phenomenal which is why it is a shame most people only know his work from his baby variant covers. The baby variant covers are decent, but the work on Oz is more detailed and truly breathtaking to behold. Of the fourteen Oz books published, Young along with writer Eric Shanower have adapted the first six. The last book adapted was The Emerald City of Oz in a 5-issue mini-series in 2013 and it is unlikely any additional books will be adapted because of dwindling sales. 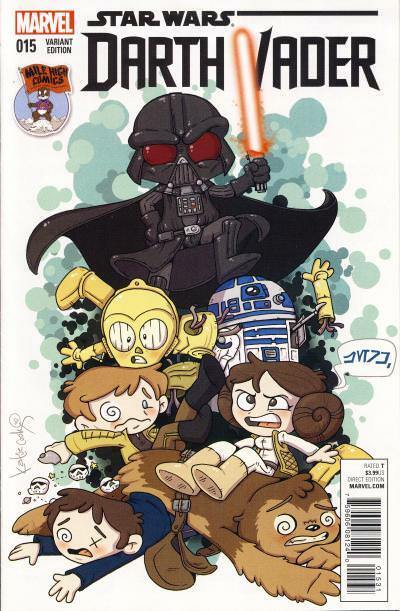 Skottie Young drew nine different variant covers for Marvel's Star Wars line. They are done in his style of baby variant covers. The first three covers for the three inaugural books connect to form one image. 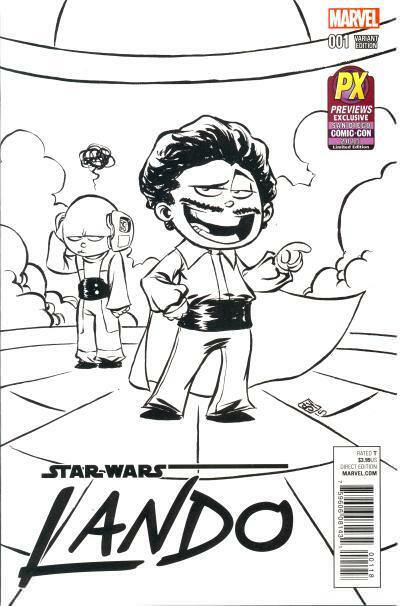 His cover artwork for Lando #1 was also used for the Previews Exclusive San Diego Comic Con 2015 exclusive. There is not a bad Skottie Young baby variant cover, but there have been a lot of them over the years, so much so that they have lost the luster they once had. Personally, I prefer the art style he used on the Wizard of Oz comics over his baby variant covers. 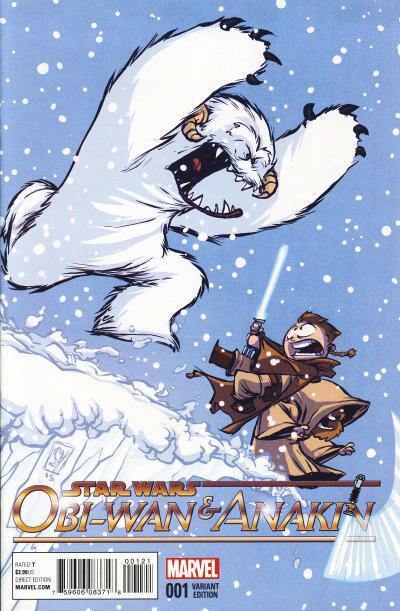 I think a Star Wars book done in his Oz style featuring either a young Princess Leia or Luke Skywalker would be a treat and that style would be a terrific match for the Star Wars Adventures anthology released by IDW. 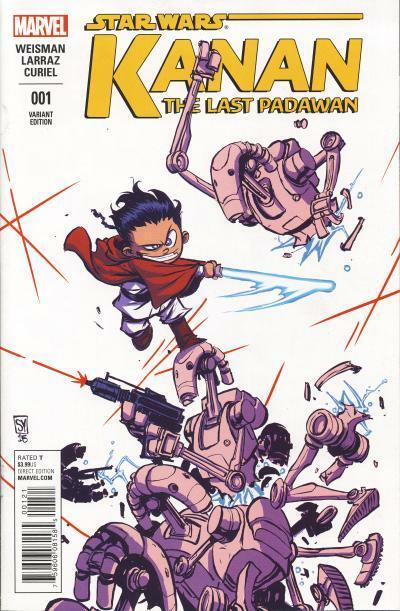 Young's baby variant style is very similar to the style used by Katie Cook who is no stranger to Star Wars variant covers. 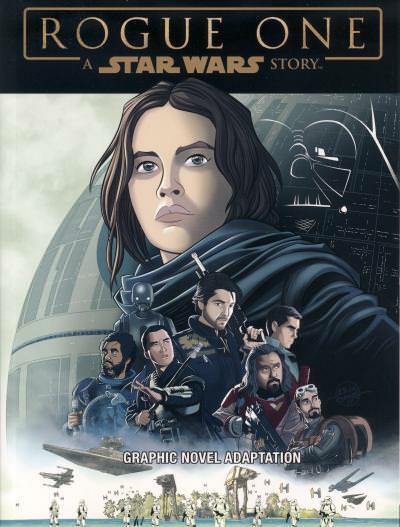 IDW published the U.S. version of the graphic novel adaptation of Rogue One in December 2017. The IDW version has a different cover than those published overseas. Like previous adaptation in this series, this all-age graphic novel does not show the more brutal scenes from the movie. For example, when Galen Erso shields the other researchers on Eadu, the movie shows the researchers being gunned down by Krennic's guards. 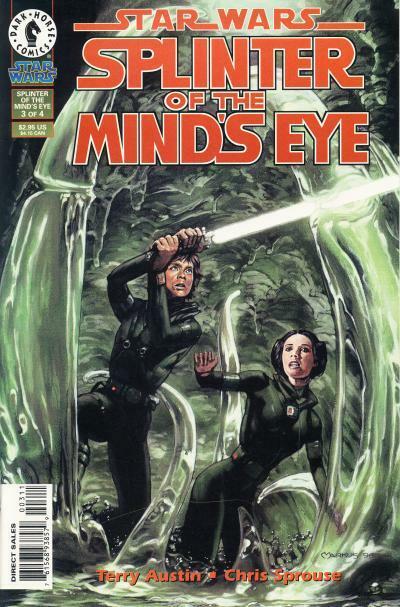 In the comic, we see Galen shield the researchers and the next panel show sCassian Andor aiming his sniper rifle at Galen. In the next panel we can see from Cassian's face and his lowering of the rifle that something horrible happened. This is followed by a panel showing Krennic punching Galen, knocking him to the ground. While it seems redundant to have both Marvel and IDW publish movie adaptations, I actually like that we are getting two versions of these stories. 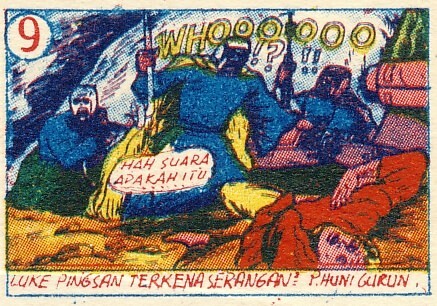 The earliest gambar umbul or banner pictures were published in Indonesia in the 1940s. A marriage between cigarette cards and comics, these early banners were single-sided and consisted of 25 panels which tell a story not unlike a comic strips. 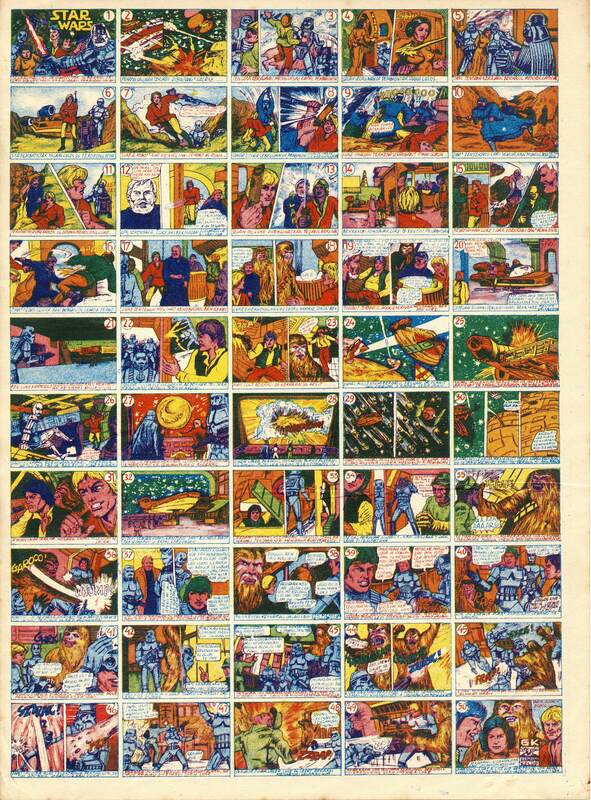 Where they differentiate themselves from comic strips is the layout and intent of the images. The images are all uniform size on a banner and numbered. Aimed at children, these banners were meant to be cut up and used as game pieces. 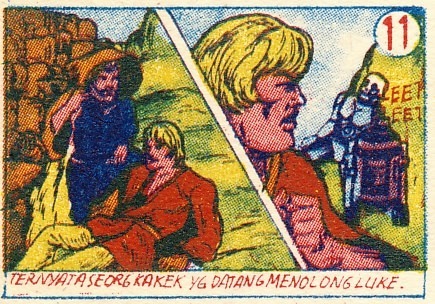 The early banners featured the wayang puppets like Petruk and Gareng, but also had characters like Flash Gordon and Mickey Mouse. By the 1970s, the banner contained 50 pictures and in the 1980s they dropped down to 36 pictures, were printed on thicker paper, and were double-sided. Banners were made featuring all sorts of comic and cartoon characters as well as television series and movies. 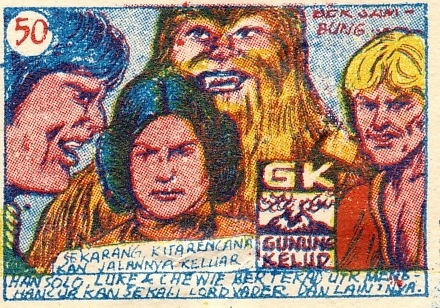 In the late 1970s or early 1980s, publisher Gunung Kelud printed a single-sided banner for Star Wars. This banner measures 8" x 10 3/4" and, containing 50 pictures, the images are fairly small. It is understandable why later banners went with a smaller picture count which allowed for larger images because your eyesight has to be very good to be able to read the words on these 50 picture banners! What is cool about this banner are the images which are taken from the Marvel Star Wars adaptation. 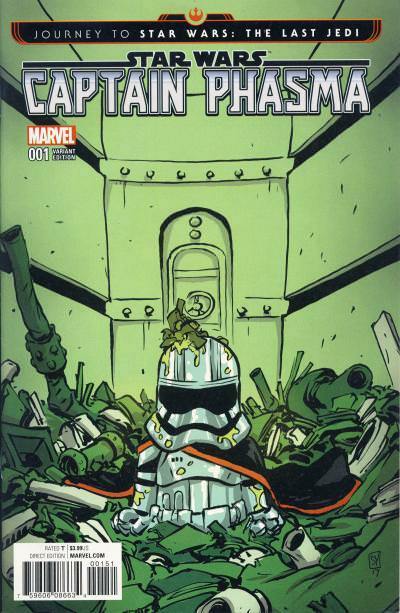 The artwork, with few exceptions, is redrawn from the comic. 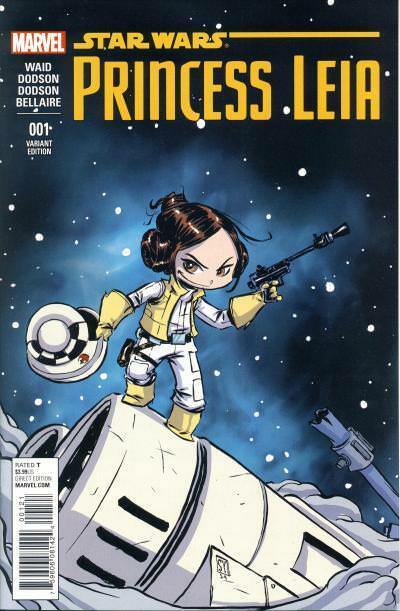 The story ends where Princess Leia is rescued on the Death Star, which is the end of Star Wars #3. 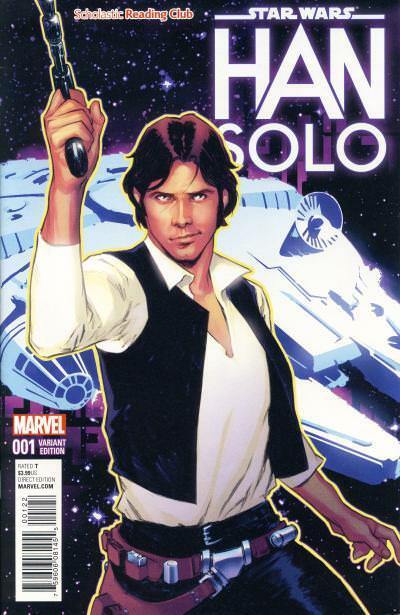 Picture #1 is taken from the cover of Marvel Special Edition Star Wars #2 and picture #2 is the splash page from Star Wars #1. 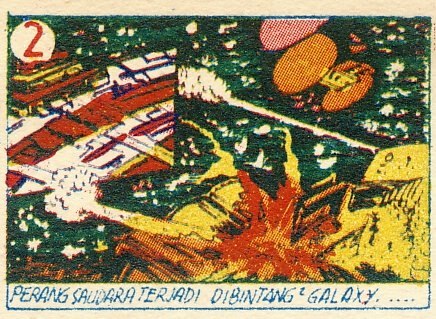 Picture #4 is two comic panels and picture #9 is the splash page from Star Wars #2. On this last image, the Krayt Dragon sound effect is drawn, but so are question marks and exclamation points near the heads of the Tusken Raiders that are not found on the original artwork. Because this banner is telling three issues worth of story, some of the pictures are drawn to tell the story in a more economical manner. Picture #11 and 22 are examples of how the artwork tells the story by taking shortcuts. While the banner is brightly colored, the color palette is definitely limited. 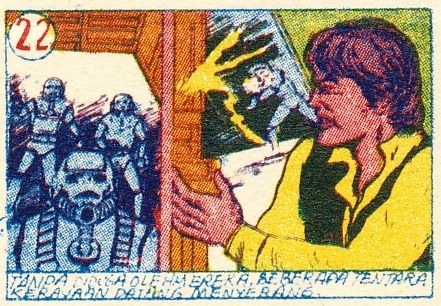 In the comic, the panel showing the Millennium Falcon's arrival in the Death Star's docking bay is less colorful than the image show in picture #32. Picture #50 has the publisher information. Gunung Kelud or Mount Kelud is an active volcano in Indonesia and obviously the inspiration for the publisher's name and logo. 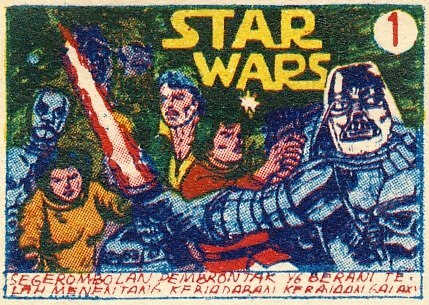 A cool aspect of collecting foreign Star Wars comics is seeing the different formats that were used to entice buyers. These gambar umbul are akin to the Chinese Lianhuanhua in their uniqueness. While the design for Darth Maul went through several iterations which toned down his initial nightmarish look, ultimately what ended up on screen is still arguably the scariest villain in any Star Wars movie. Star Wars could not have a better emissary for Halloween night than Darth Maul. Darth Maul #1 was reprinted for the Halloween ComicFest offering in 2017. 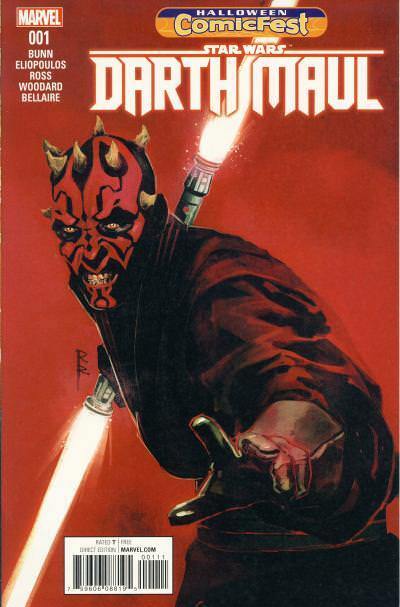 The cover art is the same as the standard cover for Darth Maul #1a. 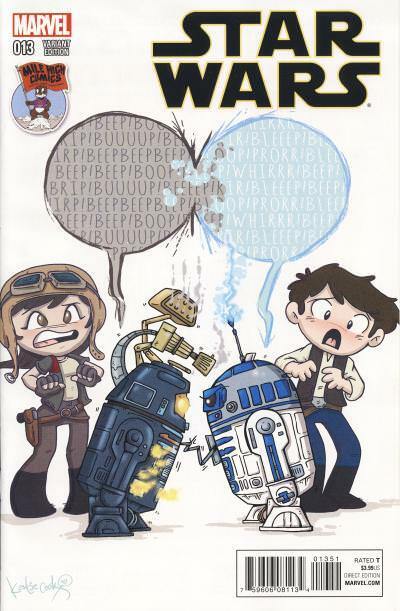 Katie Cook is an artist and writer best known for her webcomic, Gronk, and her Star Wars artwork. She has worked at Marvel, DC, IDW, and Boom! Studios. 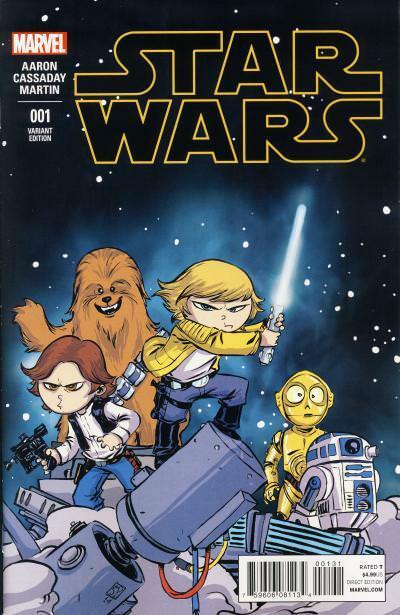 Her earliest Star Wars comic work is on the Clone Wars webcomics that were posted in 2008 and 2009 and are collected in the Star Wars: Tales From the Clone Wars - Webcomic Collection Season 1 published by Dreams and Visions Press in collaboration with Dark Horse Comics. The other artists who contributed to these webcomics are Thomas Hodges, Grant Gould, and Jeff Carlisle, but the stories Katie Cook drew are more lighthearted to match her style. 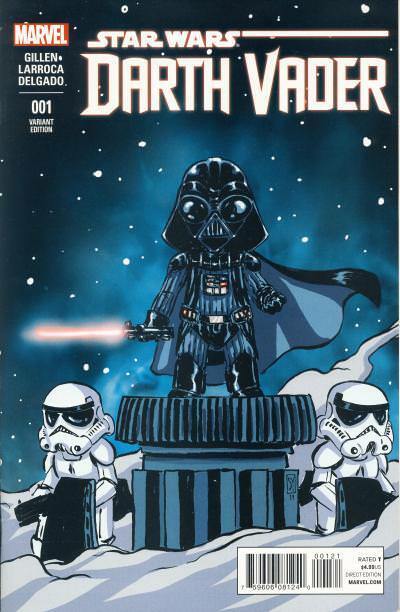 More recently, she was commissioned to provide the artwork for the Mile High Comics exclusive covers for the Vader Down event. These covers feature her artwork which is best described as adorable and cute. Much of this art looks very similar to Skottie Young's baby variant covers and I will put together a posting in the near future comparing and contrasting their styles. My Geek Box, like ZBOX, is another pop culture subscription service that originated in the U.K. but now offers their service in other countries around the world. For their April 2016 subscription box, they offered an exclusive Poe Dameron #1 variant cover by Spanish artist Pepe Larraz. This cover shows Poe Dameron decked out in his pilot uniform approaching his X-Wing Fighter with his helmet clutched in one hand. The drawing is of Poe's back and nearby is BB-8. If that sounds familiar, that is because the Poe Dameron #1 Calgary Expo exclusive cover by Mike Del Mundo has many of the same elements. Poe Dameron is the Resistance's best pilot and the title is about his leading Black Squadron, so it makes sense that the majority of the Poe Dameron covers for issue #1 would show him in his pilot uniform. What is odd however is two covers by two different artists having a similar theme. What differentiates the covers however is the composition of the elements. On the Pepe Larraz cover, everything is closer and larger. The location is a hangar bay and BB-8 is waiting between Poe and his X-Wing. Poe has a clenched fist, no doubt determined to succeed in whatever mission he is about to undertake. On the Mike Del Mundo cover, the distance between Poe and the X-Wing looks to be the same, but the camera is pulled back more. Poe is walking back to his X-Wing more relaxed, his mission clearly over, and the location is the surface of a planet. BB-8 is following alongside Poe instead of waiting for him at the ship. The sun is setting and we can see other X-Wing Fighters flying in the background. 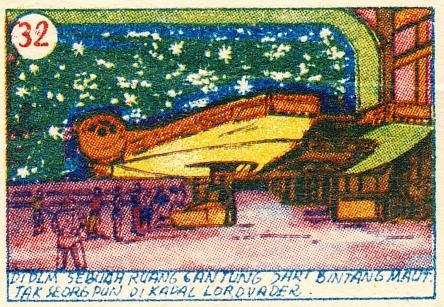 The color palette and location is softer, while on the Larraz cover the mixtures of blues and blacks along with angular shapes in the hangar makes the scene colder. 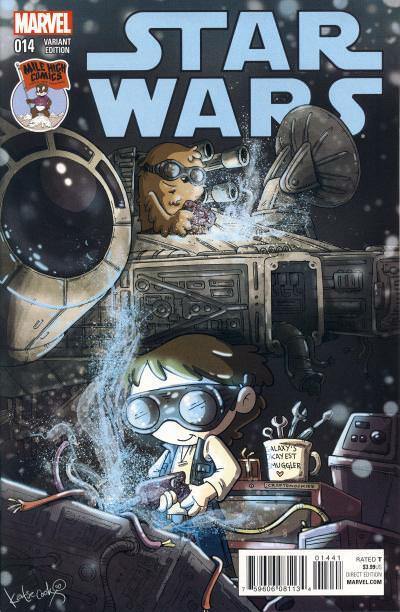 While both covers contain the three main elements, showing Poe from behind in his uniform, his X-Wing Fighter, and BB-8, they are differentiated by their execution and therefore evoke different feelings. For me, it is a tossup on which cover is preferred. It is easy enough to imagine the Larraz's cover is the start of a mission while Del Mundo captures the end of that same mission. 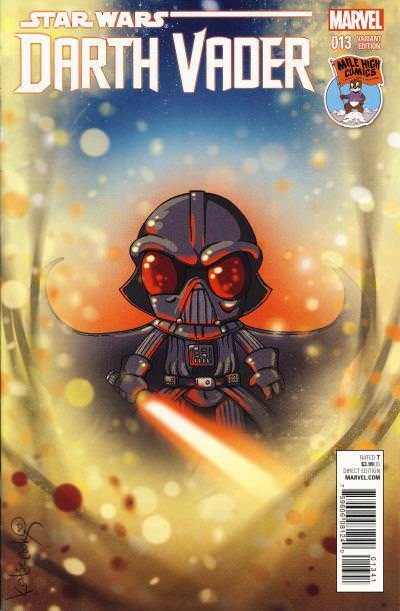 The same year the San Diego Comic-Con officially changed its name to the San Diego Comic-Con International, Dark Horse published the final issue of the San Diego Comic Con Comics. Started in 1992, this annual comic features previews of upcoming Dark Horse titles and was available at the convention. Each issue is 32-pages with black and white artwork and the title only ran for 4 issues. 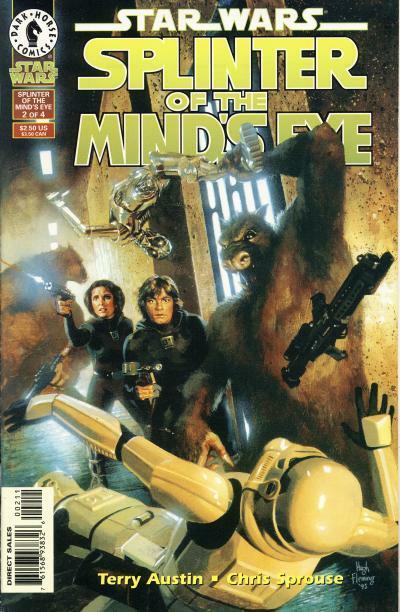 The last issue in 1995 contains a Star Wars cover and 3-page Heir to the Empire preview. 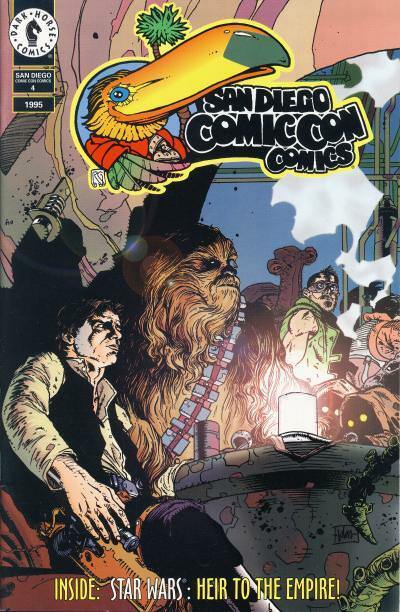 The Star Wars cover artwork is by Kilian Plunkett and shows Han Solo and Chewbacca sitting at a table in the Mos Eisley Cantina on Tatooine. In the background, hidden among several aliens, we can see the back of Wedge Antilles dressed in the familiar orange jumpsuit of an X-Wing Fighter pilot. Standing next to Wedge is the smuggler Dravis, Han's contact. The 3-page preview is pages 10 - 12 from the first issue of Heir to the Empire. San Diego Comic Con Comics #4 is a flip book with the back cover featuring artwork by Frank Miller. 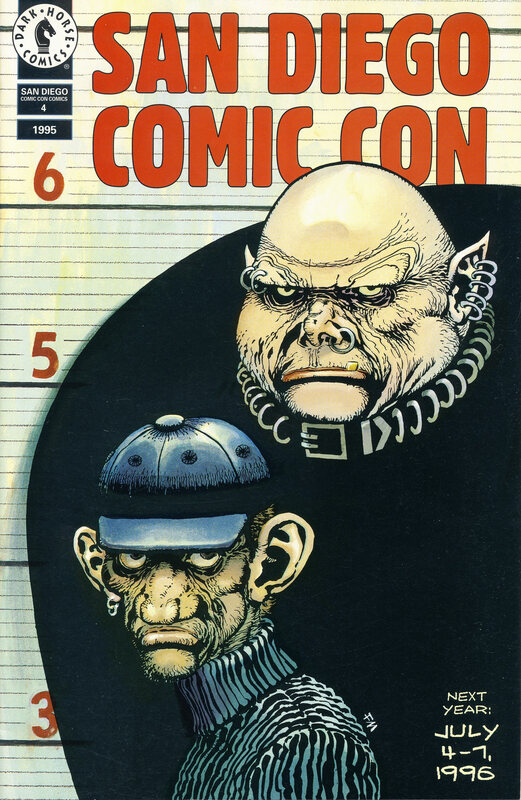 The characters on the back cover are Fat Man and Little Boy from the Sin City series. Solo: A Star Wars Story movie debuts next month and it contains quite a few treats for longtime fans of the franchise. One of the cooler inclusions is the planet Mimban, first introduced in Del Rey's Splinter of the Mind's Eye novel written by Alan Dean Foster from 1978. This book follows the exploits of Luke Skywalker, Princess Leia, C-3PO, and R2-D2 on the inhospitable swamp world. In the novel, Mimban is the location of an Imperial mining town and home to the subterranean humanoid race the Coway. 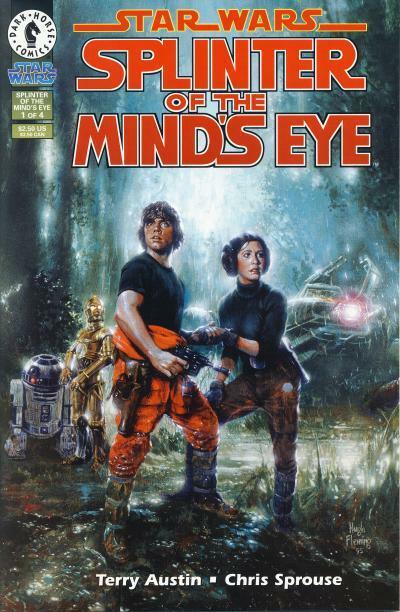 Dark Horse published a 4-part mini-series adaptation of the Splinter of the Mind's Eye novel which was reprinted in the eighth volume of the Star Wars 30th Anniversary Collection. This hardcover retailed for $19.95 and features the standard cover with a matte black background with the text in silver. The cover art is a portion of the artwork use for the trade paperback. 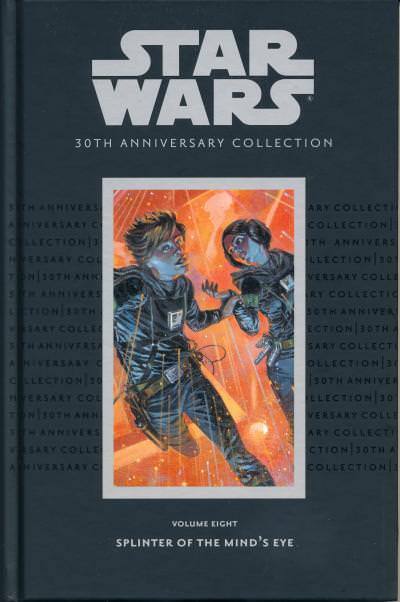 All of the 30th Anniversary Collection hardcovers were limited to initial orders. 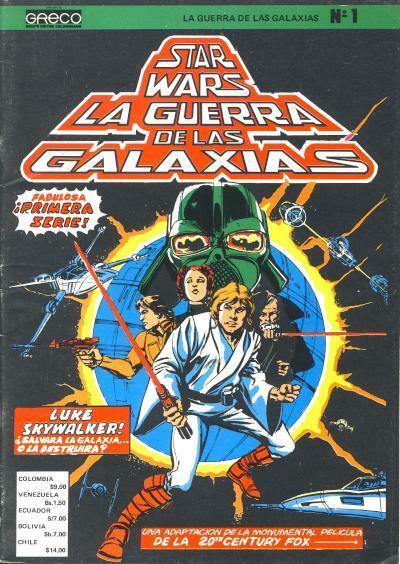 Original Ewoks and Droids comic strips were published for Spanish readers by Editorial Gespa in the magazine-sized series MyComyc. 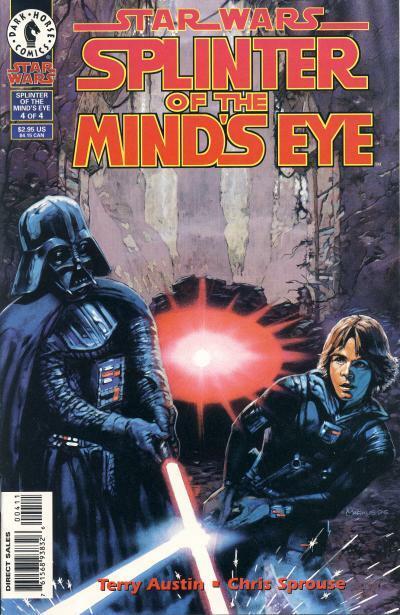 The series began in 1986 and ran for 16 issues. Each issue is very thin with only 16 color pages including the front and back cover. 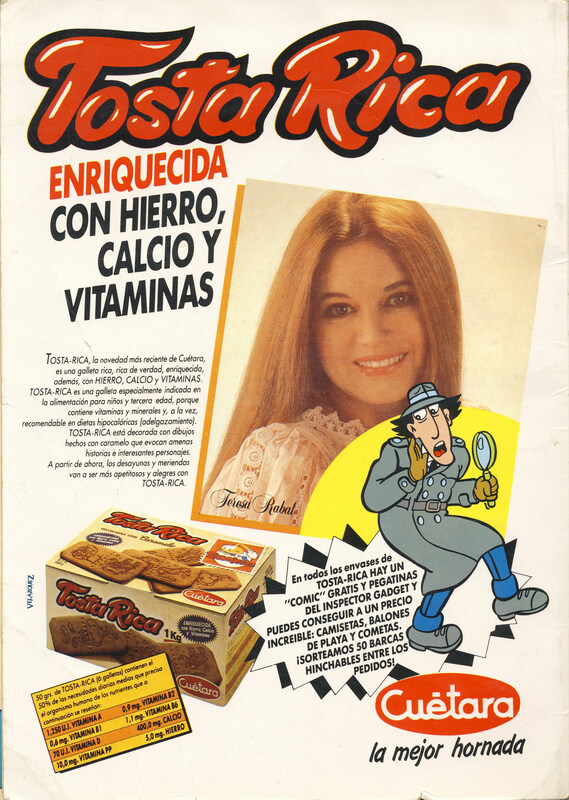 The magazine is filled with several two page strips for characters like Tom and Jerry, The Pink Panther, Inspector Gadget, and other characters that are not familiar to U.S. audiences. 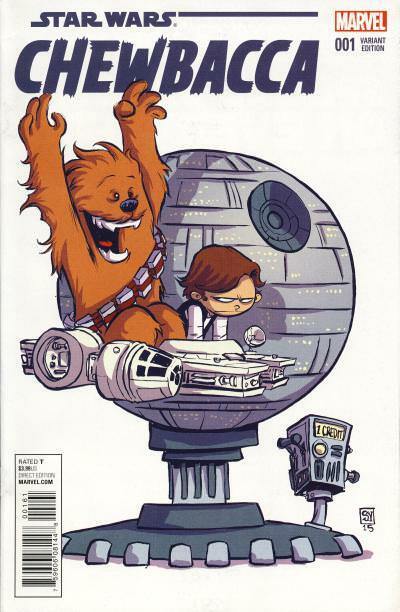 For the first 8 issues, a two page Ewoks strip appears, accompanied by a two page Droids strip in the first 7 issues. 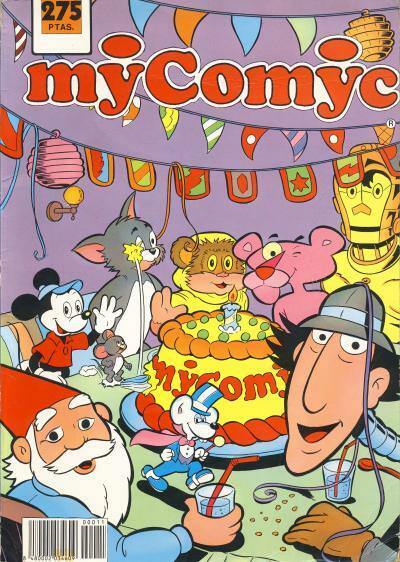 The covers incorporate the characters found in the strips into the artwork. It is a standard practice in many foreign countries to rebind individual issues for a title into collections for resale. There is a collection that includes the first 8 issues, complete with covers, bound inside an outer cover with new artwork. Whether the issues are remainders or printed just for the collection is unknown. 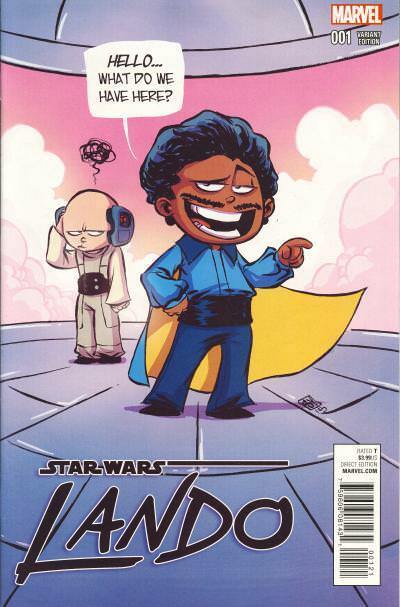 These comics were discovered by Star Wars comic fans in late 2012 when Adolfo Rodriguez posted about them on the Dark Horse Comics Star Wars forum. Poe Dameron has a major story arc in The Last Jedi, which makes it hard to believe the character was originally going to die in The Force Awakens. Actor Oscar Isaac's reluctance to take another short lived role convinced directory J.J. Abrams to rethink killing off the character giving life to the Resistance's best pilot. Poe's growth from a heroic pilot to a leader in The Last Jedi makes him a worthy successor to Princess Leia. 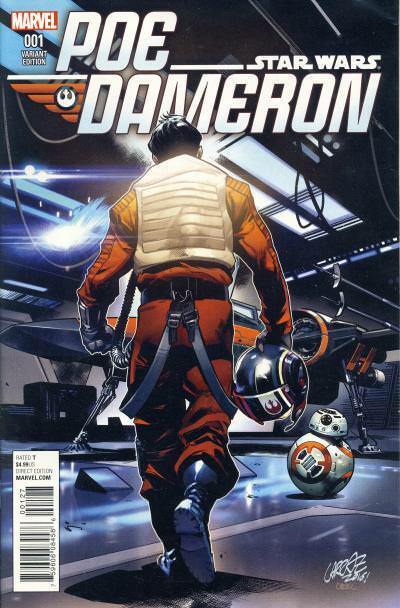 The ongoing title Poe Dameron #1 is the first comic appearance of the character; The Force Awakens movie adaptation was not published until two months later. 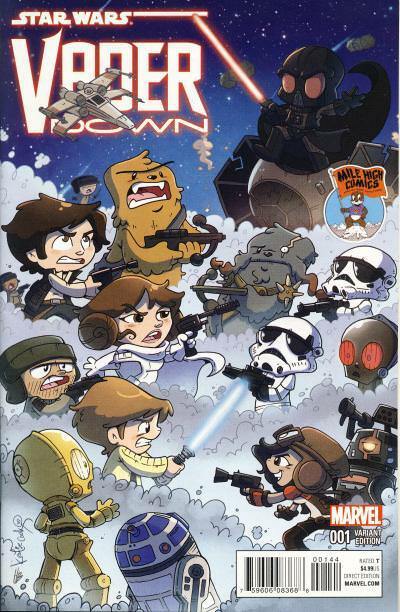 The comic stars the titular character as he leads the Black Squadron in search of Lor San Tekka prior to the events of the first movie. The Calgary Expo took place in late April 2016 and offered an exclusive Poe Dameron #1 variant cover by artist Mike Del Mundo. 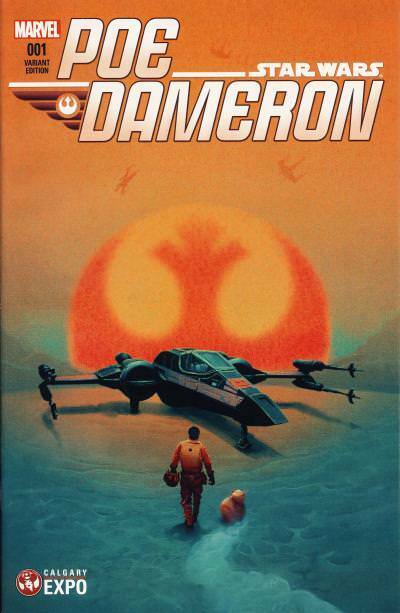 The cover shows Poe Dameron and BB-8 approaching his X-Wing Fighter while the sun is setting in the background. Transposed over the sun is the Rebel Alliance symbol which is adopted by the Resistance. Based on how many copies come up for sale, this comic does not appear to have been widely distributed. My understand is it was only given to attendees of the Calgary Expo who purchased VIP and deluxe tickets. I cannot help but wonder if the big two (Marvel and DC) understand why sales are down in recent years and if they have a plan on how to revive sales. Comic sales were down last year and sales look like they will be down again this year. I imagine there will be an issue or two that will sell well this year and maybe even a surprise title or two. Action Comics #1000 should do well because it is a milestone, the first title from the big two to hit that issue number, but, let's be honest, it is a tainted milestone due to Marvel and DC's practice of restarting titles at #1. But when you look at the upcoming publishing plans from both companies, you cannot help but feel deja vu. Take the introduction of Red Goblin in the Amazing Spider-Man title as an example. I'm sure initial sales will be strong, but in the end, Marvel has done this countless times and to be honest, the ever increasing list of Goblin characters Spider-Man has faced is beyond silly. When Marvel's sales are down, they give a supporting character the main character's uniform, give a character a new color or outfit, or "kill" a character only to bring them back later. And this tactic works, for a few months. You can understand why Marvel is publishing Infinity Countdown, because they have a big movie, Avengers: Infinity War, coming out this summer. But considering the original series, Infinity Gauntlet, came out way back in 1991 and we've had umpteen Infinity crossovers since then, you do wonder if the House of Ideas is out of ideas. Marvel reverted to their original numbering in late 2017, but several #1 issues have been announced for Marvel's next relaunch in May starting with Avengers #1. Marvel might as well relaunch every title monthly, allowing them to continuously publish new #1s. When Alex Alonzo was succeeded by C.B. Cebulski in November 2017, it looked like Marvel realized it needed to make some drastic changes to stop the bleeding, but the plans for this year look like the same old Marvel we've been seeing the past decade. I still have hope that many of the titles Marvel is going to publish this year were already set in motion and, by the end of 2018, we'll see what Marvel under C.B. Cebulski really is like. If his plans are more of the same, they should expect the same results, which, unfortunately, is dwindling sales. As for our beloved Star Wars titles, we are getting a new editor, Mark Paniccia, who is replacing Jordan White. Outside of Darth Vader, the Star Wars titles have been immune to Marvel's constant relaunching and that has been a good thing. We are entering our fourth year for the line and I like that the emphasis has been on stories over events. The few events that Marvel has done have worked because they have been limited in scope. I hope the writers continue to create new characters for our heroes to interact with and I'm happy to see the breakout character, Doctor Aphra, is able to sustain her own title. Overall, things look pretty good, but there are some tweaks I would like to see Marvel make to the Star Wars line. In the main title, someone needs to stop Salvador Larroca from tracing pictures and coloring the character's heads. The art is awful, which is a shame, because Kieron Gillen has been telling the best stories the main title has had since the Rebel Jail story arc. Gillen has fixed the characters so Princess Leia is likable, Luke Skywalker is a Rebel instead of a Jedi wanna-be, and Han Solo is getting his first taste at leadership. I hope after these Galactic Files covers, Marvel cools it with the variant covers for a while. We get about a comics worth of artwork on covers monthly and, to be honest, I wish Marvel would just publish an additional title versus publishing more covers. I think it is a crime more stories have not been told about the characters from Rogue One. There are so many potential stories there that an ongoing or a series of mini-series is warranted. I refuse to believe the high point of Marvel's Star Wars line is when they launched in 2015. 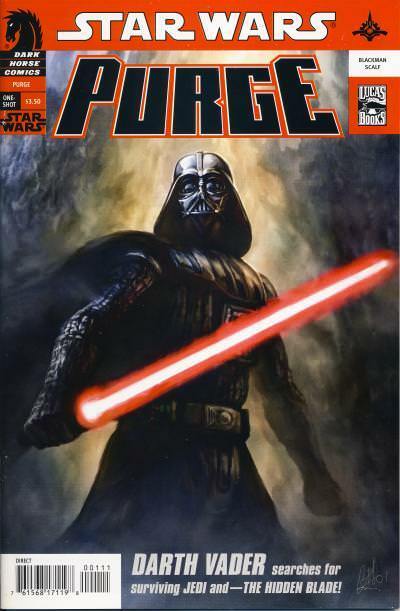 Dark Horse didn't peak with Dark Empire, but had a series of successes all the way up to the Brian Wood written Star Wars title over 30 years later in 2013. Marvel's line has the potential to be even better than Dark Horse's, but only if they have a solid plan. Here's to hoping the new editor-in-chief C.B. Cebulski has just that for Marvel overall and editor Mark Paniccia unleashes more of the potential inherited within the Star Wars brand. One of the days I always looked forward to in elementary school was when the teacher would hand out the Scholastic Book Club flyer. These flyers were full of books that appealed to me. On the days these were handed out, I would race home and immediately begin a checklist of which books I wanted. My enthusiasm was always tempered by reality; my parents would limit the number, or rather the cost, of books I was allowed to get. These flyers invoked the same feeling I had when looking at the Star Wars toys in the Sears Christmas catalog, except these came out more frequently! The first Star Wars book I ever owned came from one of these flyers, the Star Wars Storybook, and I bet this is true for a large number of Star Wars fans my age. I do not recall comics being offered in the Scholastic Book Club flyer when I was a kid, but I know through my children that you can buy comics through Scholastic today. Jeff Smith's Bone trade paperbacks are staples in these catalogs and other age-appropriate comics are also offered. 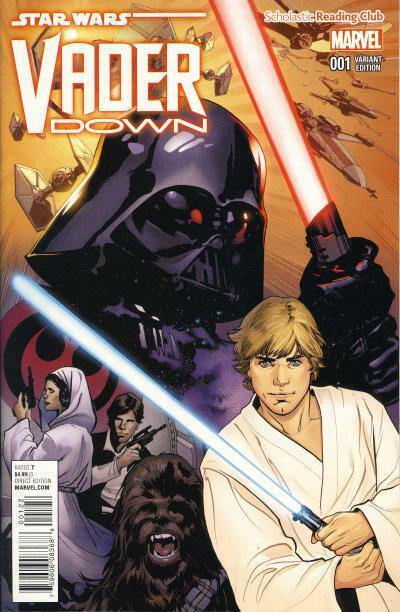 Two Marvel Star Wars comics with exclusive covers were also made available in recent years, Vader Down #1 and Han Solo #1. While I'm positive these Scholastic Reading Club exclusives were published at the same time as the standard issue, both were some of the last exclusives to be available to collectors. I suspect this is due to how they were distributed. When they first became available on eBay, copies sold for $30 or more, but today I wouldn't pay more than $10 - 15 each for a NM copy. In Darth Vader (2017) #7, Darth Vader is tasked with bringing Jocastu Nu to the Emperor alive. In Darth Vader (2017) #10, Darth Vader is successful in capturing Jocasta and recovers a memory crystal from her that contains the names and locations of force-sensitive children. Jocasta explains to Vader that Palpatine wants her alive because of that list and wants more Dark side disciples like Vader. Vader, troubled by this, kills Jocasta and destroys the memory crystal. He lies to the Emperor, telling him she died trying to escape and he did not learn anything from her. 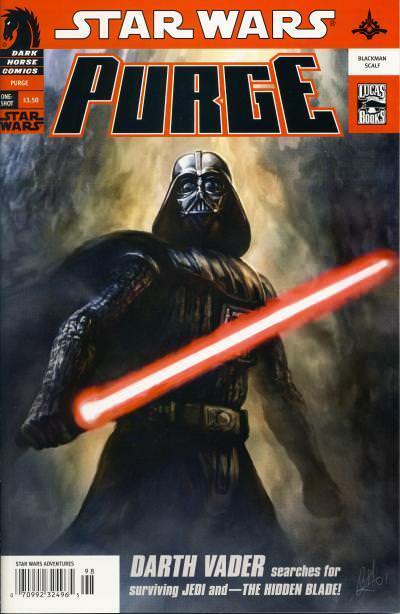 The idea of Darth Vader disobeying the Emperor was also explored in the Expanded Universe. One such example is in the one-shot, Purge - The Hidden Blade. The Empire's Tremor Base is dedicated to the construction of AT-AT Walkers on the planet Otavon XII. The native Otavi are fighting the Imperial occupation of their planet, disrupting the work, and Darth Vader is sent to hasten the construction. Vader has been repelling Otavi attacks on the base, allowing General Crik to concentrate on the work. Vader is clearly frustrated by the assignment, feeling it is beneath him. Emperor: You were sent to hasten construction of the Walkers, not pursue the natives. Darth Vader: Both seem a poor use of my training. Emperor: You forget your place, Lord Vader. Your obsession with the Jedi has clouded your judgment. Darth Vader: I do sense a powerful presence here, my Master. I am sure of it. Emperor: You will remain at Tremor Base until the Walkers are complete. If you defy my orders again, you may never leave. 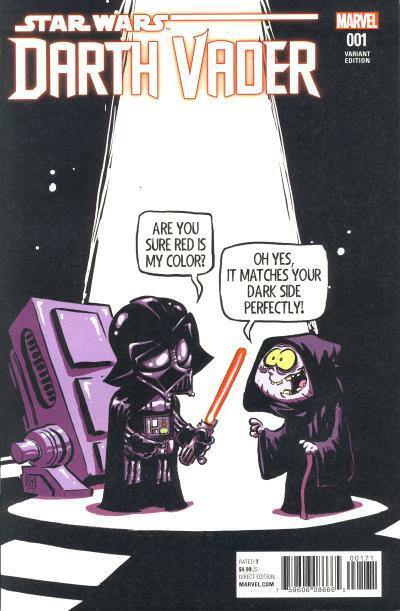 Darth Vader: As you wish, my Master. When a wounded troop from the squad returns to the base and informs Vader that there is a Jedi with the Otavi, Darth Vader sets out to kill the Jedi. Vader finds the Jedi's Padawan first who reveals where the Jedi is prior to Vader killing him. Next, he is attacked by Otavi who deploy a subsonic frequency sound emitter that calls a large creature, a Sugati, that attacks Vader. Vader is able to control the creature's mind and uses the creature to travel further from the base to where the Jedi is. 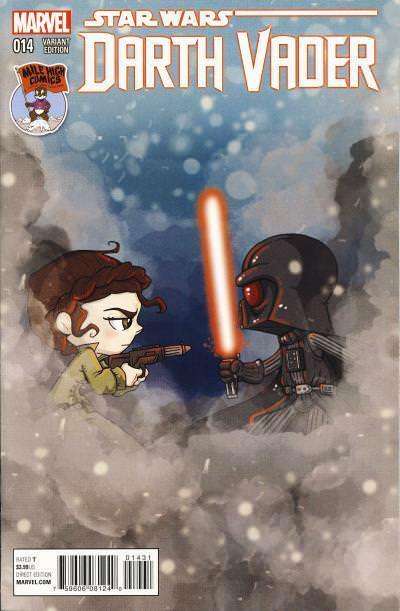 The Sugati is lured away by another sound emitter while Vader attacks the Jedi, slicing the Jedi's lightsaber in two. The Jedi surprises Vader when he pulls out another blade and attacks Vader, causing Vader to drop his lightsaber. Vader reveals he has the Padawan's lightsaber and fatally thrusts it into the Jedi's abdomen. These are the overt references to the title of the story, hidden blades, but another more subtle reference is revealed when Vader returns to the base to see it was overrun by the Otavi with the help of the monstrous Sugati. As Vader is overlooking the destruction, the Emperor flanked by his Royal Guard appears and tells Vader to "meditate on your failure here" and leaves on his shuttle. The Jedi had used another hidden blade successfully, the Otavi attack on the base, while Vader was distracted in his pursuit of him. This story shows just how obsessed Darth Vader is with hunting down and killing the remaining Jedi. He was willing to defy the Emperor, even when it results in a defeat for the Empire, in his pursuit of the Jedi.